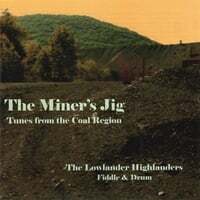 Jigs, reels, aires and laments - the Celtic roots of the Appalachian coal region played on fiddle, drum and octave fiddle. From the hills and valleys of the old world to the ridges and hollows of the new, as well as bringing the hopes and dreams of a better life, the Scots and the Irish brought music. The tones, notes and techniques of the old homeland music mingled with the same of their new neighbors and the old songs took on a new flavor - familiar but unique. Fiddles droned to capture the sound of the pipes. Drums echoed - a piece of the old world and a reminder of the natives of the new. If lyrics were sung, they echoed the present state and in this way became Americanized. The tunes on this album played on fiddle and drum reflect this heritage and leave it to the listener to supply the words and the dance. Wonderful! Best with locally produced whiskey. A strong recommend buy. Luke has really matured as a superb artist. Beverly continues to amaze.